As OK0EA was audible this morning on 23 and 13 cm I had a look for other, more distant beacons in OK. After noticing a very short and weak signal on 2320.9085 MHz, I monitored the frequency over a couple of hours and saw many doppler shifted traces, typical for aircraft scatter. Very soon I copied “…9DP…”, when a B777 crossed the path and was sure to see OK0ER in JN99DP in the waterfall diagram. At least 4 Airbuses A380 crossed the path one after the other, giving nice reflections. OK0ER transmits 1.5 W into a slot antenna in 675 m asl. The distance is 722 km. 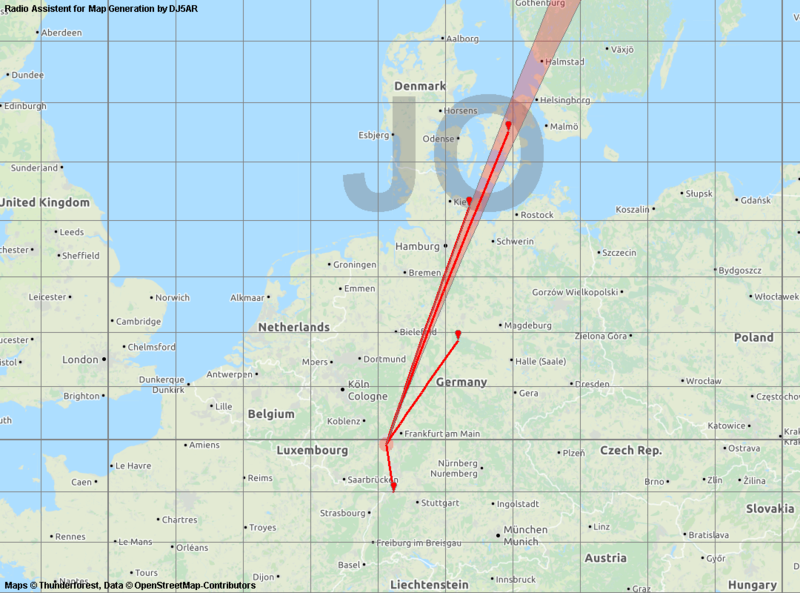 This entry was posted in Aircraft Scatter, Beacons and tagged 13 cm, 2320 MHz, Aircraft scatter, beacons, OK0ER on 2018-10-22 by admin. Needless to say, the email arrived and I turned my dish to Eindhoven. Now I am delighted by my own signal. Amazing to see it increasing by reflections on an A380 passing the path, while two Dutchmen are talking a little lower in frequency. 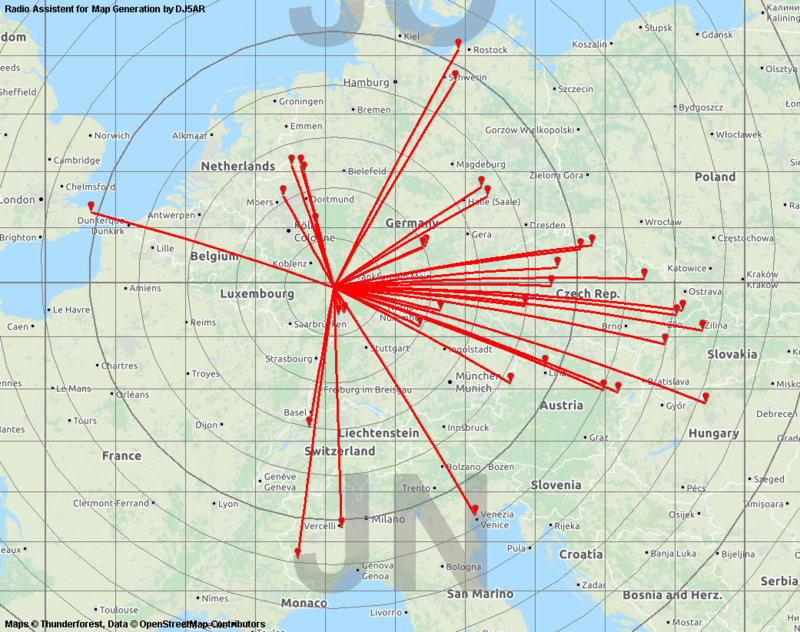 This entry was posted in WebSDR and tagged 13 cm, 2320 MHz, WebSDR on 2018-10-16 by admin. As can be noticed now, the fears, many Microwavers would prefer to go to the HAM RADIO fair in Friedrichshafen, were overdone. 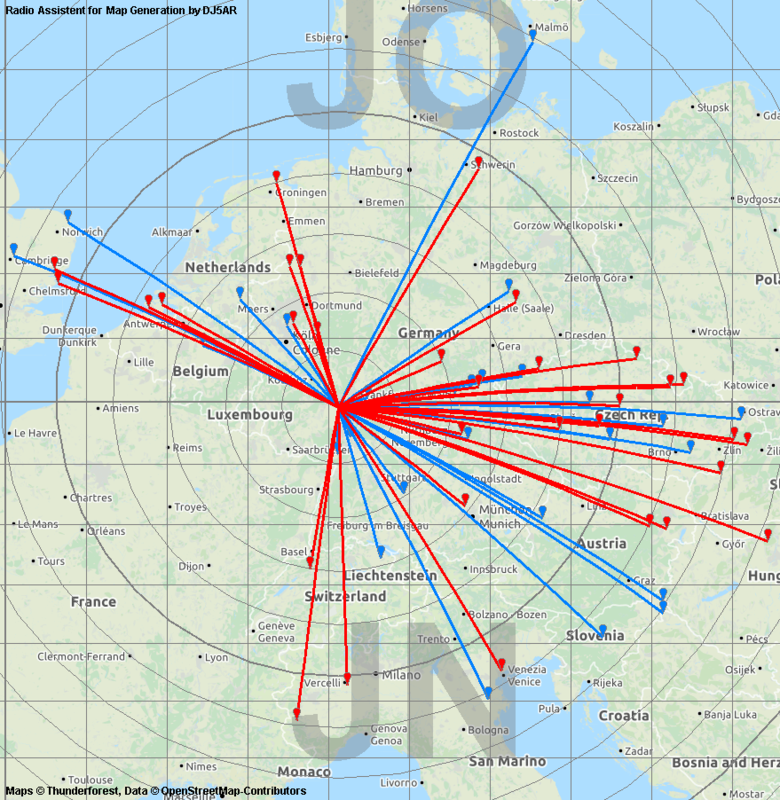 It was a nice contest and in the 23 and 13 cm sections I worked more stations than in the last contests in May and March, as well as in all previous microwave contests I participated in June before. As can be seen in the maps, my honey pot is the east. Working on 13 cm was big fun and ODX was HG7F over 817 km in a quick QSO in CW (as usual). When I went to bed at night, I already had 22 QSOs on this band with an average of 457 km per QSO. Hannes, OE3JPC, was so kind, to send an audio record of my signal on 13 cm. First steps have been done on 3 cm. But there is a lot of potential for improvements. So it was not really a problem to quit two hours earlier to attend a barbecue with the family. This entry was posted in Contest and tagged 1296 MHz, 13 cm, 23 cm, 2320 MHz, Contest on 2018-06-03 by admin. The other day I noticed some cluster spots about a new beacon DB0WML in JO31MU on 2320.910 MHz. So I had a look for it today. Nothing via tropo, but nice reflections on airplanes. 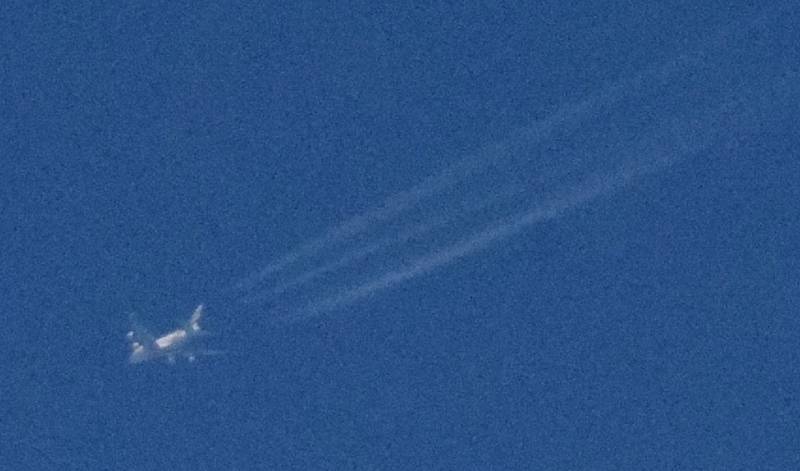 At least I was bearing to an A380 in a distance of about 30 km at a height of 12 km with 33° elevation, to record this clip. Also I was lucky to get a snapshot of this particular bird! The beacon is operated by DARC local chapter N40, keeper is Rudolf, DK8QU. 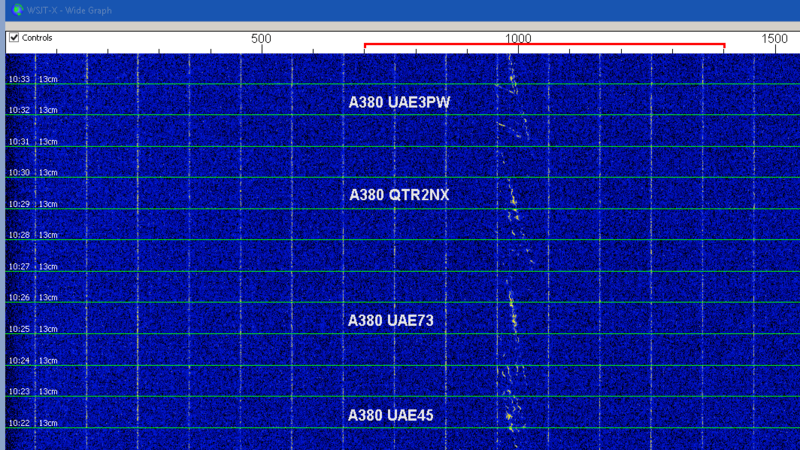 The screenshot shows DB0UX on 2320.900 MHz, DB0MJ on .904 and DB0WML on .910 in good Neighbourhood. 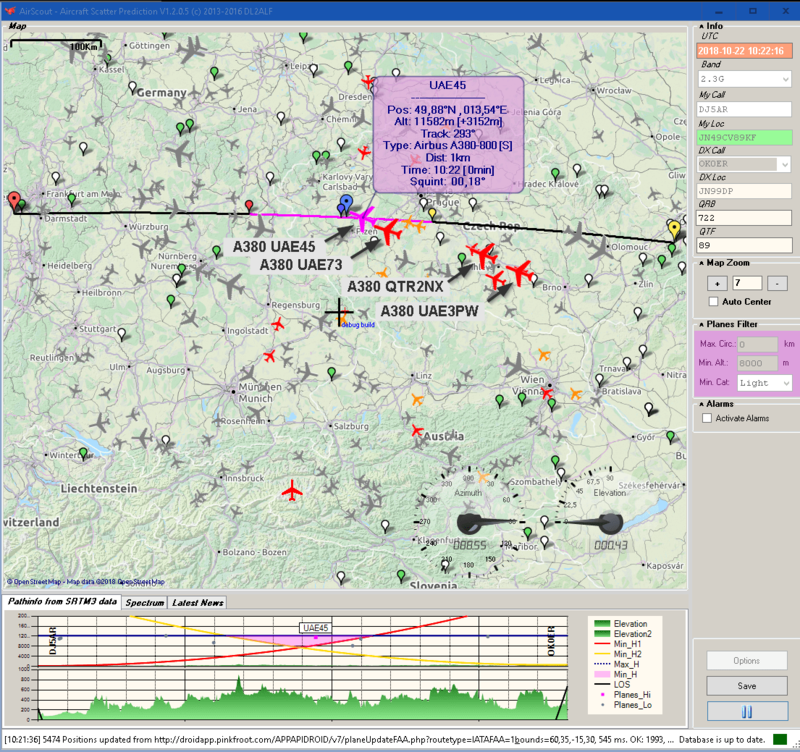 This entry was posted in Beacons and tagged 13 cm, 2320 MHz, Aircraft scatter, beacons on 2018-05-07 by admin. 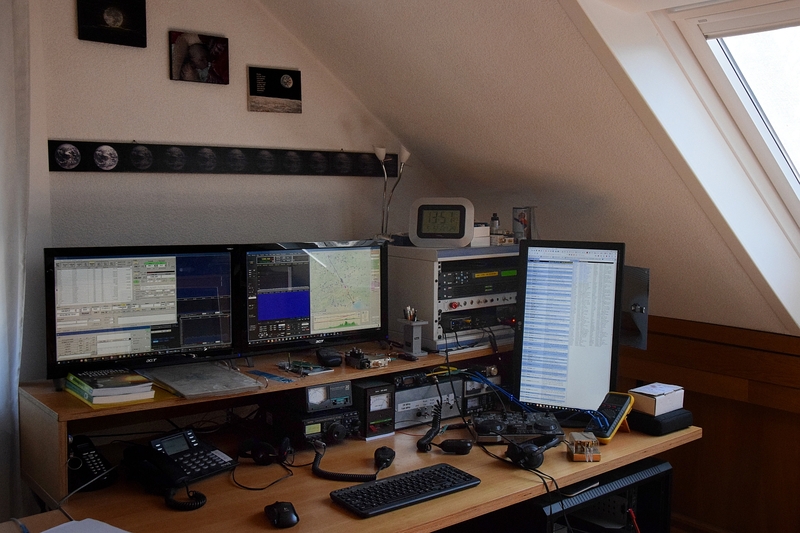 It´s one of the rare moments in the life of a Radio Amateur, when his shack is cleared up. Beyond believe, everything was up and running 2 hours (!) before contest time. Being a kind of bewildered, I sorted the stuff on my desk. The amazing result can be admired in the photo I took hereafter. Starting with a nice QSO with M1CRO in SSB on 23 cm, I tried the new 3 cm Equipment, mounted on the VHF/UHF pole. 1 W into a 50 cm dish should be enough to collect first experiences. Two QSOs over 100 km were entered to the log. Quite nice, but further tests showed, that the topography is not ideal to cover larger distances, without the help of e.g. tropo, aircraft or rain scatter. Then I had my focus on 1296 and 2320 MHz, as usual. At least 58 QSOs, 36 squares and 14 DXCCs on 23 cm and 32 QSOs, 25 squares and 10 DXCCs on 13 cm have been logged. ODX, as last year, was HG7F in JN97KR over 817 km on both bands. Having an easy exchange on 1296 MHz, it took us nearly 20 minutes of hard work to puzzle a QSO on 13 cm as well. I remeber, last year it was vice versa. This entry was posted in Contest and tagged 10368 MHz, 1296 MHz, 13 cm, 23 cm, 2320 MHz, 3 cm, Contest, DJ5AR, SHF on 2018-05-06 by admin. Tonight I monitored OZ7IGY on 2,320.930 MHz via aircraft scatter. It was nice to see other beacons appearing shortly in the waterfall diagram. The dish was bearing 20° to OZ7IGY. The -3 dB beamwidth is just 3.2° on 13 cm. This entry was posted in Aircraft Scatter, Beacons, Tropo and tagged 13 cm, 2320 MHz, Aircraft scatter, beacons on 2017-12-22 by admin. As the weather forecast promised heavy thunderstorms for today, I was looking out for scatter points on 13 cm. Pointing to eastern France, I found a heavily scattered signal of DB0UX in JN48FX in 204°. But the sound was quite strange and rhythmic. When taking a look out of the window, I saw the dish pointing at two windmills in 1 km distance. This kind of scatter is not very helpful, but a nice experience anyway. 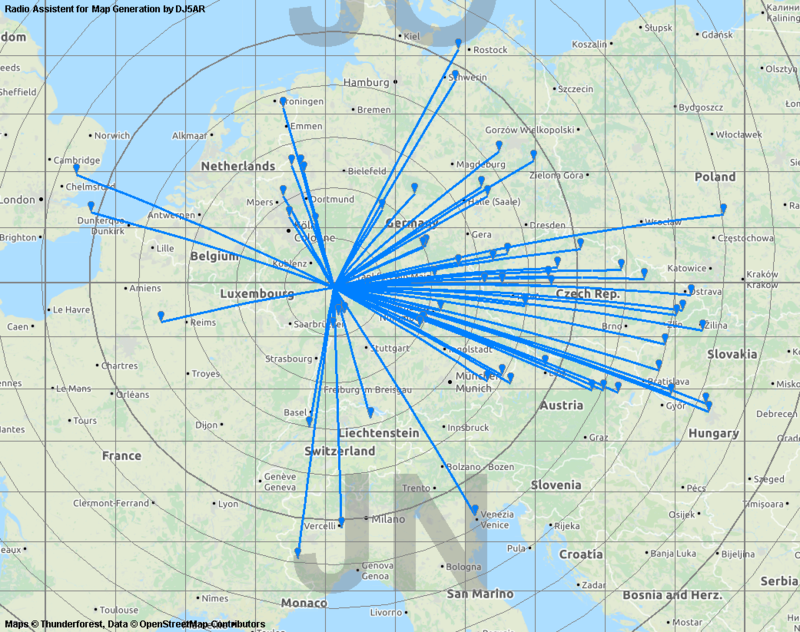 This entry was posted in Beacons, Propagation, Tropo and tagged 13 cm, 2320 MHz, Beacon, DB0UX, Windmill Scatter on 2017-08-30 by admin. Another ARISS contact with an YOTA event in England was scheduled. HAMTV should be operated by Paolo Nespoli, IZ0JPA. As some nice video sequences could be received on 13 cm, nothing was heard on the 2 m downlink on 145.800 MHz in FM. This entry was posted in ARISS, HAMTV, ISS and tagged 13 cm, 2320 MHz, ARISS, DATV, DVB-S, HamTV, International Space Station, ISS, NA1SS, Paolo Nespoli on 2017-08-08 by admin. VHF/UHF/SHF Contest May 2017 – Record breaking again! With QSOs to Poland, Hungary and Belgium three new countries could be added to the 13 cm list. HG7F (817 km) is my new aircraft scatter ODX. Also some new grid squares could be logged. And again: After the contest is before the contest! A lot of ideas are in my mind, what has to be improved for the next competitions! This entry was posted in Contest and tagged 1296 MHz, 13 cm, 23 cm, 2320 MHz, Aircraft scatter, Contest on 2017-05-07 by admin. Sometimes you hear words that hurt. Especially if they are true: Some years ago I tried 13 cm EME with Dan, HB9Q, and couldn´t copy anything of him. His comment after the test: “There is no way, not to hear me!” This is frustrating. So I forgot Moon Bounce on this band and had fun with other activities, mainly on 23 cm. But the over 30 year old equipment caused more and more problems. So I started collecting parts and modules for a new transverter system covering 23 and 13 cm. It had been finished for the last VHF/UHF/SHF contest in March and was tested with good results. In the end of March I tried EME again after 2 years of absence. On 23 cm it worked fairly, but on 13 cm the drift was a serious problem. In a test with Alex, ZS6EME, I could decode his strong Signal, but not vice versa. So I added 10 MHz Double Oven Controlled Oscillators as references to stabilize the transverters. As he switched his RX from 2304.070 MHz to my TX frequency 2320.070 MHz at about 12:14, we completed very fast. 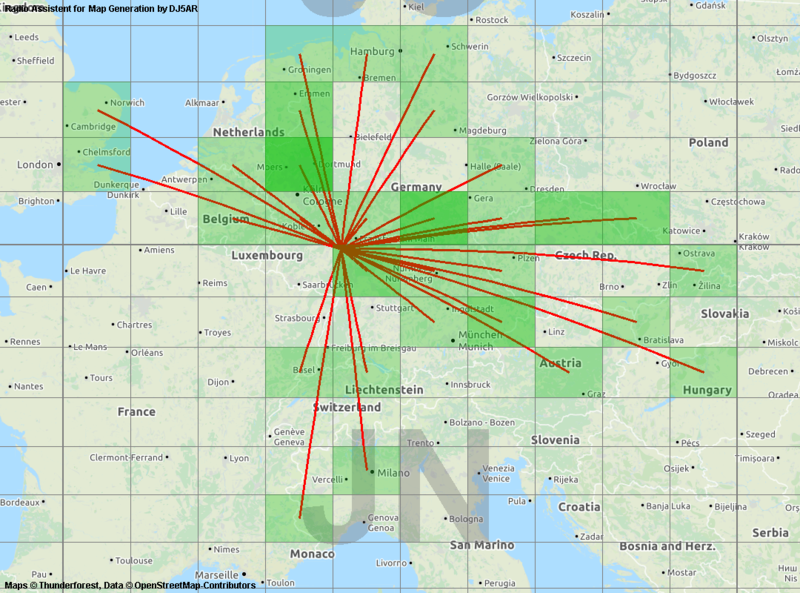 I am very pleased now with my first initial on 13 cm, a new grid square, a new ODX, a new DXCC and a new continent! After setting up a new Initials List for 2320 MHz and writing this blog entry, I enjoy my “Radio Operators High”! This entry was posted in Moon Bounce, Propagation, WSJT and tagged 13 cm, 2320 MHz, EME, JT65C, Moon Bounce, WSJT on 2017-04-28 by admin.